Stae – a “total etch”, single component dentin/enamel system with fluoride release. Duke S E., Adhesive bonding directions: Where are things going?, Compendium November 1999. Stae, THE DENTAL ADVISOR Vol. 15, 1998. Duke S E., Ultrastructural and Physical Property Studies of Stae single component Adhesive system, 1997. Peumans M., Kanumilli P., De Munck J., Van Landuyt K., Lambrechts P., Van Meerbeek B., Clinical effectiveness of contemporary adhesives: A systemic review of current clinical trials, Dental Materials 2005, vol 9, p 864 – 881. Damiani F., Duva G., Merlati G., Bruno E., Legame tra sistemi adesivi smalto-dentinali e compositi : valutazione sperimentale (Dentine-enamel adhesives and composite bond: an experimental study), Dental Cadmos 2005; vol.73, 10:39-50. Duke S E.; Adhesive bonding directions: Where are things going? ; Compendium November 1999. For both clinicians and the industry, adhesive dentin bonding technologies have continued to be a challenge in restorative applications. There is little doubt that adhesives play a critical role in the survival of direct and indirect restorative procedures. An examination of the literature reveals that the principal cause of failure of direct and indirect restorative materials is recurrent caries or marginal staining. One way of looking at this is to realize that failures with modern esthetic materials occur at the interface between the remaining tooth structure and the restorative materials. In other words, we are experiencing adhesive failures with our esthetic restorative procedures. Products such as Stae are representative of one-component adhesive systems which require some conditioning of the enamel or dentin with an acid solution as an initial step to application of the primer / adhesive solution. When used properly a well developed hybrid layer is formed at the tooth / material interface, and laboratory studies have confirmed that favourable physical properties result. Research results would support the conclusion that the newer systems are capable of obtaining a strong bond to dentin surfaces. However, results would also suggest that greater care must be observed when using these newer adhesive systems. So, in answering the question regarding the one-component vs the multi-component adhesive, the answer would appear to be related to operator technique and strict adherence to manufacturer’s instructions during application. With previous systems, the dentist had a comfort zone built into the system, but it took more time for placement and provided less variance with technique deviations. The single-component systems may take less time for placement, but this positive aspect requires strict adherence to technique to avoid the variability that has accompanied these technologies. Stae; THE DENTAL ADVISOR, STAE, Vol. 15, 1998. 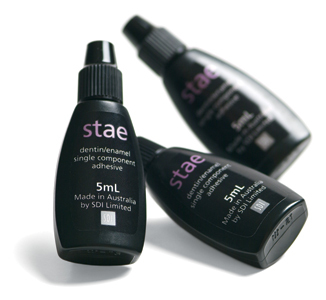 Stae is a highly recommended adhesive system designed for composite, compomer and porcelain bonding. It received an 86% rating. Stae is an acetone-based, single-bottle, light-cured dentin/enamel adhesive system. Stae contains a resin system that decreases polymerization shrinkage and microleakage. Stae was evaluated by 16 consultants and received an 86% approval rating. Stae combines both primer and adhesive in one bottle to simplify and decrease patient chair time. The bottle is easy to use and assistants can readily control the number of drops dispensed. Consultants and assistants rated Stae good to excellent in packaging, instructions, ease of coating preparation, and effectiveness of bond to dentin and enamel. Seventy percent of consultants reported the performance of Stae as the same as or better than their current bonding system. Ninety-four percent of consultants experienced successful bonding with no failures reported during the evaluation period. Seventy percent of consultants indicated that they would recommend Stae adhesive system. Duke S E., Ultrastructural and Physical Property Studies of Stae single component Adhesive system , 1997. The broad objective of this research is to perform detailed interfacial studies and physical property tests of a new “one component” resin adhesive system. Specific Aim 1. To characterize the interdiffusion zone of resin resulting from the Stae dentin adhesive system. Scanning electron microscopy and transmission electron microscopy were used to image the resulting interdiffusion of resin into dentin following acid conditioning of the dentin. Specific Aim 2. To measure the adhesive physical properties for the Stae Adhesive System used with Glacier Composite Resin. Specimens for adhesive bond strength and microleakage measurements were fabricated. Data was generated using standardized laboratory methods. These studies were used to provide significance and confirmation to the above ultrastructural findings. The specific aims of this study were to characterize the ultrastructure of the adhesive-dentin interface of a new one component adhesive (Stae Adhesive System – Southern Dental Industries). The adhesive system was further tested using laboratory adhesive physical property tests. SEM observations of the Stae Adhesive System revealed hybridization at the dentin-resin interface. In addition collagen fibrils within the hybrid layer show evidence of complete bonding with no signs of denaturing or loss of structural integrity. The mean shear bond strength for Stae was 22.5 MPa. The advantage of having only one component to the adhesive system after dentin conditioning should simplify the technique and produce more consistent clinical results. Peumans M., Kanumilli P., De Munck J., Van Landuyt K., Lambrechts P., Van Meerbeek B.; Clinical effectiveness of contemporary adhesives: A systemic review of current clinical trials; Dental Materials 2005, vol 9, p 864 – 881. The purpose of this paper was to review current literature on the clinical effectiveness of contemporary adhesives when used to restore cervical non-carious class-V lesions. Restoration retention in function of time was recorded in order to find out if adhesives with a simplified application procedure are as clinically effective as conventional three-step adhesives. Stae was tested in the selected class-V clinical trials. At 12 months, it is one of three bonding systems having 100% retention rate! Original paper is in Italian. This study evaluates the adhesion quality of composite restorations bonded to one-step (self-etching systems) and two-step (“total-etch”) adhesive systems. Study uses dye penetration test and stereomicroscopy for analysis. Ice and Stae were among the materials used by the authors to represent the two steps adhesive systems. It was found that two-step systems represent the best compromise between bond strength and quickness of use.